The Cost Intelligence System provides comprehensive insight into the profitability of individual shipments and loads. Its powerful analysis and reporting tools find the answers carriers need to get the results they want – accurate and credible costs that can be rolled up for specific customers, freight terminals or lanes. Solutions geared toward both truckload and LTL providers give carriers the freight costing data needed to analyze freight profitability and traffic flow. Whether carriers are concerned with customer profitability, analysis of existing traffic, or the development of cost-based rates for pricing and traffic activities, LTL/CIS can be tailored to provide resounding results. SMC³’s LTL/CIS contains unit costs and statistics developed directly from each carrier’s general ledger and operating data. Truckload service is much more than a linehaul move from one point to another. Loading and unloading, stop-offs in transit, headhaul/backhaul implications, varying pay scales, the use of owner-operators, and empty mile allocations all complicate the task. Interfacing with mileage programs carriers already have in place, SMC³’s TL/CIS costing model simplifies this complex equation by developing the cost of moving individual loads, making specific trips and handling entire customers. Carriers operating in a load-to-ride environment where LTL orders are loaded and taken to directly to their destination, reducing freight handling compared to traditional LTL, can utilize truckload CIS to analyze profitability and automate the costing process. SMC³ improves its cost systems using feedback from customers gathered during user group meetings. By constantly listening to CIS users and sharing new information with them about our products, SMC³ is making sure it remains on the front lines of the supply chain, adapting to changing needs to help LTL and truckload carriers use the latest and greatest tools to analyze costs and streamline their operations. The LTL and load-to-ride systems interface with Rateware XL, rating shipments while they are costed, applying discounts and accessorials to revenue development. CIS routinely costs all freight moved in each accounting period to produce a costed traffic database. The reporting tool lets users analyze both profitable and unprofitable freight. The profit center produces freight terminal profit and loss statements, basing revenue allocations on standard cost. 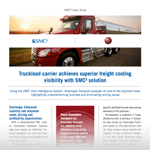 © SMC³, Inc., providing CzarLite® LTL base rate, the leading LTL pricing benchmark. All rights reserved.